Long-range frigate ‘Kraken’ was built under the Imperial Security Service's all-seeing eye. This example of Empire's engineering serves just one purpose — eliminating Aliens. To everyone's surprise, "clean" earth technologies, as it turned out, are almost as good as Alien technologies. While Jericho and the Federation adjusted to the new discoveries of xenotechnologists, the Empire continued to bend its line. And it gave its fruits - the destructive power of the main tool "Kraken" surpasses all modern samples. Now "Kraken" is undergoing flight tests and equipment calibration with the participation of the most trusted mercenaries of the Empire. АSniper gun, which additionally deals thermal damage: 1500 pts. to frigates and 14850 pts. to destroyers. Burns 528 pts. energy after it hits target for 3 sec. Damage and energy burnt depend on the level of the main weapon installed on the ship. 185 en. 3 s.
Launches a guided missile, causing thermal damage during an explosion. The explosion leaves a radioactive cloud dealing 1281 pts/sec. damage to all targets in a radius of 270 m. for a period of 10 s. - 16 s.
Sniper gun, which additionally deals thermal damage: 1500 pts. to frigates and 14850 pts. to destroyers. 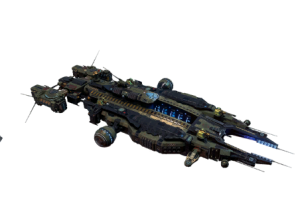 After the first hit target loses 3049 durability over 10 s. Damage depends on the level of the main weapon installed on the ship. 185 en. 3 s.
Hull resistance to thermal damage increased by 30 pts. Hull resistance to EM damage increased by 33 pts. This page was last modified on 5 April 2019, at 18:44.